This stunning 2 acre executive lifestyle property is sure to impress, and properties of this calibre are a rare find. Privately tucked away behind secure electronic gates, this amazing property strikes an immediate impression…. Surrounded by quality acreage homes and a good, quiet neighbourhood, this immaculate spacious 2 storey home is set amongst beautifully landscaped gardens all on a fully fenced, sensational 8001sqm block. 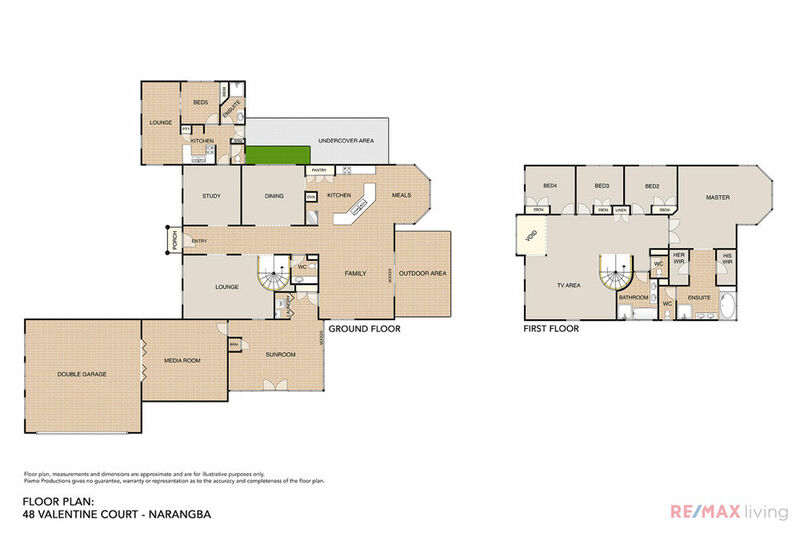 This peaceful and tranquil location offers you the opportunity of a unique investment in one of Narangba’s most desirable lifestyle locations. Spectacular from every aspect this amazing home is just pure elegance, every detail meticulously planned and executed… offering, generous proportions and beautiful interiors with superb finishes through-out…. from the glossy Italian floors to the high ceilings and beautiful wrought iron staircase…. there is no shortage of design. This magnificent family home offers 5 spacious bedrooms, 3 bathrooms, 4 toilets, powder room, home office, 3 living areas, formal and casual dining, lounge room, sunroom, theatre room with surround sound, laundry and a fully self-contained unit with private courtyard …makes this the perfect private retreat for extended families or guests. The well-appointed open plan kitchen provides outstanding entertaining options, with a fantastic indoor/outdoor flow to outdoor entertaining areas overlooking a sparkling 15-metre in-ground pool that boasts built-in spa seat, pool water features and pool lighting that will provide hours of family entertainment. The beautiful private pool area affords you an indulgence in a fun and relaxing lifestyle with a tiered water fountain, poolside cabana and alfresco dining area; access to a bar, fully equipped with fridges, ice maker, kegerator, sink, and gas hot water. This home has all the elements of a relaxed family lifestyle… So if the WOW factor is what you’re looking for …… then this property is a must to inspect!! Call Terry today for your private inspection…he’s available 7 days. * Fully fenced property, two sets of double gates access at the front, and a access gate at rear of property. * Large double garage with tiled floors and built-in cupboards..
* Stunning gourmet kitchen with Granite bench tops & waterfall sides, breakfast bar, quality appliances, dual oven, and extra-large fridge space in main kitchen. Unit kitchen has matching granite bench top with waterfall side. * Chicken coop/large run nestled in amongst non-invasive bamboo gardens at the rear of the property. * Schools and child care; sporting facilities and golf courses. * Shops are located close by and it’s a short drive to the North Lakes precinct which offers Westfield Shopping Centre, Cinemas, Community Centres, Clubs and much more. * Easy access to the M1 offering commute to Brisbane and the Sunshine Coast. * Short drive to the beautiful Redcliffe Peninsula and Newport Marina & Yacht Club.